The Chester River is a pipe-shaped river with its narrow stem in Delaware and its wide bowl opening into the Bay between Eastern Neck Island and the north end of Kent Island in Maryland. The Chester River Watershed is located on the western edge of Delaware in New Castle and Kent Counties. The headwaters of the Sassafras River lie to the north and the Choptank River is to the south. The Delaware portion of the Chester River Watershed contains headwater tributaries that drain to the main stem of the Chester River in Maryland. Cypress Branch, the most northerly stream, drains southwestward, while Sewell Branch directly below drains in a westerly direction. Furthest to the south in the Chester River Watershed is Gravelly Run, which drains northwestward and meets Sewell Branch several kilometers west of the Maryland-Delaware state line. 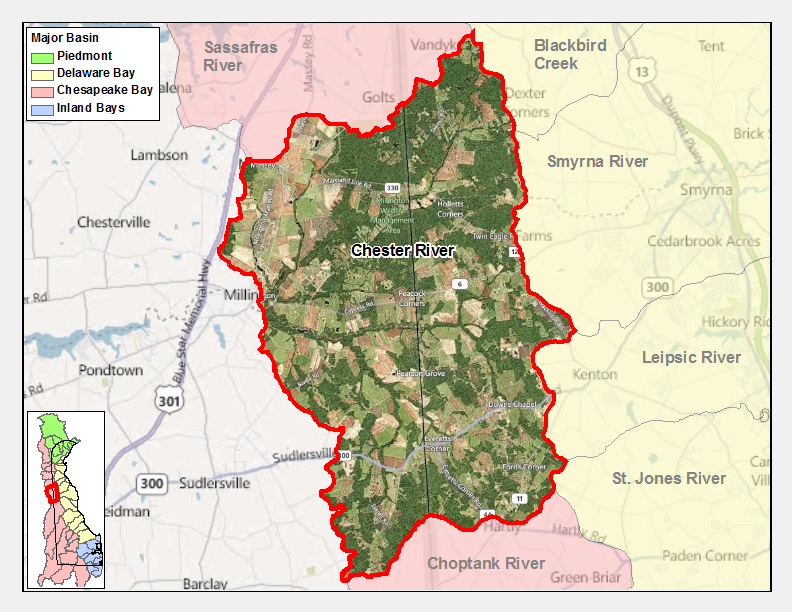 The drainage area of Chester River Watershed within Delaware is approximately 40 mi2. The designated uses for the waters of the Chester River are primary contact recreation, secondary contact recreation, fish, aquatic life, and wildlife, agricultural water supply, and industrial water supply. 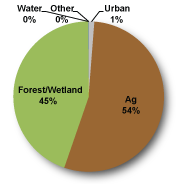 The land use within the watershed is dominated by agriculture, wetlands, and forests. Hartly, which lies on the southern border of the watershed, is the only incorporated town. Ducks, geese, bald eagles, and other water-loving birds make their homes along the entire 60-mile course of the river from Delaware into Maryland. Hunters flock to the Chester in the fall because the river is on a major migration route for Canada geese. The waters of the Chester are spawning and nursery areas for many fish species, including alewife, shad, blueback, and perch. Striped bass is the most prized anadromous (freshwater spawning) fish found in the Chester. Known locally as "rockfish", the striped bass is very valuable commercially. Concerns in the watershed include low dissolved oxygen, nutrient over-enrichment, and high levels of bacteria. There are no active point sources discharging nutrients and bacteria into the Chester River, therefore, all pollutants are coming from nonpoint sources such as septic systems and animal operations. The Delaware watersheds draining to the Eastern Shore of Maryland, including the Chester River, are required under the 2000 Chesapeake Bay Agreement to reduce nitrogen and phosphorus loads by 46.8% and 43.5% from levels that were present in 2000. Also, State of Delaware Total Maximum Daily Loads (TMDL) require 40% reductions in phosphorus and reductions of bacteria by 37%. Nitrogen is required by the TMDL to remain at 708 lbs per day. The streams in the northern portion of the Chester River Watershed are marsh-like due to the surrounding wetlands, while to the south, they are ditch-like, due to the agricultural influence of the area. Soil types in the watershed, from north to south, include grades from Mattapeake-Sassafras association (considered by the Natural Resources Conservation Service to be "well-drained, medium textured and moderately coarse textured soils on uplands"), to Keyport-Elkton and Fallsington- Mattapeake soils, to Fallsington-Pocomoke association at the border between Kent and Sussex Counties (predominantly heavier, more poorly drained), to Pocomoke Fallsington-Sassafras association (considered by the Natural Resources Conservation Service to be "very poorly drained, poorly drained, and well drained soils that have a moderately permeable subsoil"). On average, the stability of stream banks in the Chester River basin is fair to poor. As lands within the basin were developed for agriculture and later urbanized, many miles of stream banks became highly eroded. Since the streams in this basin flow into the Chesapeake, this bank instability causes an increase in downstream transport of nutrients and suspended sediments to the Bay.